A couple months ago, I received a copy of Awesome Science Episode 1: Grand Canyon. 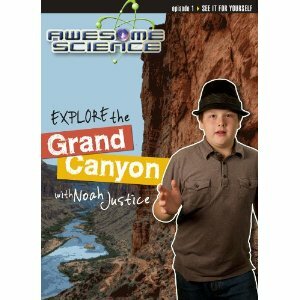 Awesome Science is a great new series hosted by genuinely likeable 14-year old host, Noah Justice, exploring science from a Biblical Creationist worldview. This series is aimed at children and teens and – as most of my readers already know – I have a standing rule: No matter how much I like it, if my kids don’t like it, it gets a bad review. My kids are picky. My kids are uncivilized, unapologetic boys. Worse still, they are MY boys; I’m as blunt as a bag of hammers and about as subtle as a chainsaw and, well… you know what they say about oaks and acorns! Relax. They loved it as much as I did! I couldn’t wait to do the review, but since we’ve never done a DVD review, we decided to do things a little differently. When I told my kids I was going to do an interview, they wanted in on it. So we came up with a list of questions – and I sincerely hope you can tell which questions were the boys’ fault – and buried that list in a mayonnaise jar under the back porch… OK, it wasn’t anything that dramatic. I sent the list to Compel Media and Kyle and Noah Justice sent back what follows. My first question was rather obvious, but I’m always curious as to where people get such good ideas. This is mostly because while I’ve had the lion’s share of incredibly bad ideas, good ideas are pretty rare for me. [DefGen]: Where did you come up with the idea of making these Awesome Science videos? How did it come together? [Kyle]: “Since the 1980’s I have been producing television programming for some pretty big networks like ESPN, The Outdoor Channel, and National Geographic. In 1986 heard a Creation Scientist (Dr. Donald Chittick) talk at our church camp about scientific evidences for the biblical account of creation. I think it was then that God planted in me a desire to produce programming which focused on this subject. In 1996 I produced my first project with this focus; “The X-Nilo Show” in association with Answers in Genesis. The project did well, but it was pretty high in budget, so we were never able to produce more. In 2000 I produced a national series of videos for the Angle One network called “The Creation Network”. In that same year I developed a new series called, “Awesome Science”. We shot a pilot episode with two adult hosts, but with new demands to support my family, I never finished the episode. Ten years later, As Noah and Jeremiah (my two oldest sons) were growing up and taking an interest in video production, I opened the vault and brought out the old Awesome Science tapes. We tried to finish the episode, but felt like there wasn’t enough to complete it. We were taking a family trip through some of the national parks and decided to take my gear and shoot with Noah as the host. When we got back and looked at the footage, we were pretty happy with the results. I called up my friends at Answers in Genesis and asked them if they would be interested in a new series. They were enthusiastic about it, so we proceeded to script the programs and shoot the green screen of Noah. We first thought we had one good program from our trip, but found out we had enough material for four episodes of Awesome Science. The three episodes that have come out are from that trip. It was my plan to sell the videos mostly to Answers in Genesis, but when I was trying to get permission to use some artwork from Master Books, I showed them my rough edits and they offered to become my national distributor because they saw some great potential in it. It was amazing to see that when we were faithful to what God put on our hearts, He opened some amazing doors. [DefGen]: Tell us about the filming process. What went into filming episode 1? How long did it take? [Kyle]: When we took our 25 day road trip, we knew some general places we wanted to visit; Yellowstone, Grand Canyon, etc. I had some based on my knowledge of creation science, there were some key points about each area, but I didn’t write a script before we went. When we got to certain locations, we put Noah in front of the camera and he said a few lines. At first I thought we’d get one episode from our trip, but we got four episodes. After we got back, I ordered some audios and videos on each of the locations we visited. I wish I had ordered them before I went, because I would have shot things a little differently. I used those materials to write a basic outline of each episode. From that outline, I wrote the script. This took about a week to write. I then submitted the script to Answers in Genesis for technical review, which took almost a month. After we had the approved script with changes from AIG, we were ready to shoot. As I went through the script, I chose parts where I thought Noah should be on the green screen and places we could just make narration. I also chose parts of the script I wanted Noah to be back on camera. You see, we had just a few places of Noah at the national park and I wanted him to be on more. Oregon is such a great place for scenic and geologic locations that it was perfect. This took about another week. Shooting the green screen and recording the narration took about a day, then another day to log the footage and narration. By this time we were ready to edit. One of the challenges for our episodes was finding the right images. We had a lot of images, but needed many more. I did many searches on the Internet for royalty free image stock and found quite a bit. The USGS and National Parks host a lot of images. I also obtained a full library of Grand Canyon images from AIG. In addition, as a professional producer, I have bought many stock aerial video images of mountains and deserts, so we used a lot of those in each DVD. Once we had all of the images, video of Noah, and narration, we were ready to edit. Initially Jeremiah, Noah’s 12 year old brother did much of the rough editing of the narration and Noah’s on-camera scenes, putting them together according to how the script was outlined I then came in and starting filling in the images and video. After this pass, I started to add music and graphics. Jeremiah also took over rendering the map animations from Google Earth Pro. It was really a group effort. Editing probably took 2-3 weeks. Once finished, we sent a copy of AIG for final approval. They usually had a few changes. Once they were made, we mastered a disk for Master Books and they started distribution. [DefGen]: Is that a real dead skunk on the DVD? [Kyle]: I’m pretty sure it is. I obtained a lot of photos for the program and did searches on decaying animal photos. Some were pretty gross, with worms coming out of the dead meat. But this one was pretty tame. Unfortunately there was not a title that said, “Dead Skunk”, but it sure looks like it could be. [DefGen]: Did you run into any problems filming this project? [Kyle]: One of the biggest challenges was when AIG first reviewed the project, they had one of their researchers helping us. But after a while they realized how big of a project it was going to be, they assigned Dr. Andrew Snelling to be our reviewer. Dr. Snelling went back through and made additional changes. We had already recorded Noah’s green screen and narration the first three episodes and there were enough changes in Dr. Snelling’s notes that we had to rerecord with Noah both the green screen and narration. The changes slowed us down by a couple of months. This was a lot of work, but we feel the project was much better. We had a really good script review AND Noah’s performance was better the second time around. When we get ready to produce additional episodes, we feel we really have a good system down for review with Dr. Snelling. [DefGen]: In the production stills [one of the extras on this DVD], my kids noticed that various members of the Justice family are holding up a big flat disk. They want to know what that was and why you were holding it? [Kyle]: The flat disk is known as a “Flexfill” and is used often when we shoot out doors in the sun. A video camera cannot see the huge changes in contrast, so shadows on the face look black. We use the disk to help filling the dark spots to make more even lighting on the face. We have a silver side and a white side. What side we use depends on what effect we’re going for. [DefGen]: You seem to have a lot of fun together on this project [We really enjoyed the blooper reel!]. What’s it like working with family on a project like this? [Kyle]: Noah is a great kid and we’ve always enjoyed our time together. As a producer and director, there are times when I had to push Noah to get his best performance. We also had some late night recording sessions and Noah as getting pretty tired, but we were able to get it done. With some past projects, I’ve been gone from the family for extended amounts of time, so getting involved on a project with my son and family has been a real joy. We laugh a lot together and come up with some fun ideas. I’ve always tried to encourage each of my children to have fun at what they are doing and do their best to honor the gifts that God has given them. [Noah]: It was fun. It certainly was a learning experience for the little kids, learning to be quiet. But also a learning experience for me. Being scrunched in the back row with my brother and a bunch of pillows and blankets on our trip was a learning experience too. When we went to the Grand Canyon, I had to make sure to set a good example by not going too close to the edge. It was a lot of fun. [DefGen]: Did you find any fossils while at the Grand Canyon? [Kyle]: On our road trip, we only shot at the Grand Canyon for one afternoon. We didn’t make it to the bottom of the canyon. Because of this, we didn’t see any fossils. But we determined we needed to come back and do a white water raft trip of the Grand Canyon in another episode. [DefGen]: If you could visit any place on planet earth, where would you go? [Noah]: I would love to go to the center of the earth because it’s the only place that has one location that I know I will have enough time to explore. [Kyle]: Antarctica, because so few have been there and there’s some great ice sheets. [DefGen]: My kids love the hat, Noah. Where did you get it? [Noah]: I got the hat at Kohl’s several years ago. It was for a wedding because I was an usher at the wedding. I kept it and liked it. So it seemed an obvious choice to wear it on our trip. When we shot, I was wearing it. My dad liked it and so we kept and turned it into the “look” I had for the show. [DefGen]: Noah, do you believe wrestling is real? [Noah]: I don’t watch wrestling on TV, but if I had to guess…no. [DefGen]: In the blooper reel, Noah jokes that some scientists think aliens carved the Grand Canyon with space lasers (an awesome image, by the way); while this was just a joke, what has surprised you most about some of the things evolutionists believe in their efforts to defend their all-natural theory of origins. [Noah]: The craziness of some of their ideas. There was one idea that a heat wave killed out all the dinosaur’s favorite plants and so they all died off because they wouldn’t have eaten any other plant. [DefGen]: What’s your favorite dinosaur, Noah? [DefGen]: One of the things that really impressed me was how meaty this DVD is on the science end. I didn’t hear about some of the things you relate in this video until I took college geology. What kind of research did you have to do, and what sources did you draw from? [Kyle]: I knew that if we were going to provide a strong case for science and the Bible, I needed to get some good sources. I obtained audio programs and videos mostly from Dr. Andrew Snelling at AIG and used much of this in writing the episodes. I knew AIG was one of the main buyers of the DVD series, so using information from their key scientist was a good idea. I have also been working with Dr. Steve Austin on a geology documentary series, so I picked his brain on some of script concepts. It turned out that Master Books asked that each of the episodes be approved by AIG before they started distributing it, so it all worked out well. [DefGen]: Do you have to memorize your lines, Noah? Or do you read off cue cards? [Noah]: Not fully memorized. In some of the long shots on the green screen, you saw me switch from side to side. That was because those big parts were too hard for me to memorize in 3 minutes to do the shot. So I just memorized a line or two, said them fast on camera, and then cut to the next line. We didn’t use cue cards. [DefGen]: Who’s your favorite superhero? [Noah]: Between Hawk Eye and Captain America. Normally it would have been Iron Man, based on the cartoons of him as a youth, but the movies of him as an adult do not reinforce Biblical truths. Captain America because he’s the first Avenger, and Hawkeye because he has awesome bow skills. [DefGen]: Noah’s answer reminds me of something else I noticed about this DVD. I just love how clearly and unapologetically you present the truth of creation and catastrophism. For example, you state up front that millions of years is a belief associated with secular humanism, just as thousands of years is associated with Biblical creationism. What convinced you that Genesis could be trusted as a reliable history of our origins? [Kyle]: Because I knew very early in my life that the Bible was true (and never doubted this) the evidence would be there, all we had to do was look. The secular scientists keep coming up with more and more theories, some are very crazy, because they cannot explain everything they see. We can’t see all of the evidence yet either, but from what we can see, the clues sure point to the Biblical record being truth. You can’t pick and choose what parts of the Bible are true or not, and you can’t believe in man’s opinion. You’ve got to have a baseline to operate from, and since God made the world, the Bible is our baseline we go to for everything. [DefGen]: Why do you think these videos are important? Why should people buy and watch them? [Kyle]: We are losing our youth at the Middle School and High School levels because they are not given enough evidence for the areas of creation and the Flood. When faced with evolution as “fact” and they don’t have the tools the refute evolution, they start to doubt their faith in the Bible. The evidence is out there, but there aren’t too many ways for youth to see it. This series is the start of many series for youth to give the evidence they need to refute the lies of evolution and show them they can believe with confidence that science and the Bible do agree. The medium of television is powerful and it’s the way our culture communicates worldviews today. This is a powerful series to help shape a generation of youth. [Noah]: They reinforce Biblical truths that have been lost in today’s media culture and they have science that most kids would really, really like. It studies Flood Geology and shows that Noah’s Flood was true. [DefGen]: What sort of reactions have you got to these DVDs so far? [Kyle]: It’s been amazing to see the reaction. Everyone seems to love them. Even young kids are doing reviews on their mom’s blog and it’s so much fun to watch. We also heard recently that a young kid was reading a science book which talked about millions of years, but they stopped reading and told their mom that it wasn’t millions, but only thousands. The mom attributed his worldview to watching the Awesome Science episodes. That is exactly what we set out to accomplish and it’s fantastic to hear it happening in real life! We do have the episodes up on Amazon Video On Demand. We have got some adults giving their opinions, which come from a secular worldview. They are pretty merciless in their opinions. Some have said, “This is not science and should not even have it in the title.” Some have gotten a little vicious in their attacks. We just smile and know that all press is good press. We also have some wonderful reviews on Amazon for those who have actually watched the episodes. [DefGen]: What can we look forward to in the future from Awesome Science and Compel Media? [Kyle]: We would love to produce a continual series of Awesome Science episodes. We have three more episodes already being scripted out for a Fall release. We are planning on shooting at least seven more episodes this fall and releasing them in 2013. We desire to create a brand out of Awesome Science. We would like to see other related Awesome Science products like board games, books, vacation bible school programs, creation conferences, science camps, iPad applications for home school learning, and the list goes on. Once we get enough episodes produced (about 13) we would like to begin airing them on national broadcast television. These episodes won’t be the full-length episodes on the DVDs, but much of the material will make it on. Immediately we are also planning on a big social media burst of short videos such as behind the scenes, outtakes, interviews, and Do It Yourself experiment videos. We feel like the list is endless. As far as Compel Media, this last summer we produced the first in an adult series of documentaries called, “The Flood Geology Series”. Our first documentary was on Mount. St. Helens hosted by Dr. Steve Austin. We’re planning on producing additional documentaries with Dr. Austin. We are just beginning to shoot with Michael Oard on producing two documentaries in the series, one on “The Great Ice Age” and “Evidence for the Flood Waters”. The opportunity to produce DVD series is endless. As a family we’ve talked about the idea of producing kids shows on God’s unique animals, ancient inventions, as well as extreme adventures related to creation science. [DefGen]: One last question for Noah: Now that you’re already famous, what do you want to be when you grow up? [Noah]: I have had my heart set on being a medical nanotechnician and also being a missionary to Israel. [DefGen]: So we can definitely expect great things from both Noah Justice personally and Compel Media. Awesome Science videos are available AnswersinGenesis.org, NewLeafPublishingGroup.com and from Amazon Instant Video. You can find out more about Awesome Science at AwesomeScience.tv and check out their video trailers (and a whole lot more) on their YouTube channel – http://www.youtube.com/user/awesomesciencetv/videos. And be sure to Like them on Facebook.